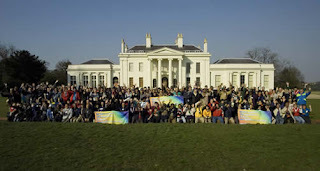 I returned home from Delhi at 7:00am and immediately traveled on to Gilwell Park to help with the organisation of the second Heads of Contingent meeting for the World Scout Jamboree. Over 60 countries represented from all over the world and over 150 delegates. We provided them with logistical information about the Jamboree, took them to Hylands Park to see the camp site, answered their questions, put on a Scout show and hosted an international evening where they shared food and drink from their countries. The event seems to have been a great success and hopefully has reassured them that we are ready to welcome 40,000 visitors in the summer.